Greetings Villains! Well who’ve thought that our little demon villain was once an angel?? VILLAIN: ORIGINS Sonnellion begins today! Our origins series are a bunch of short 4 page stories that fill in the backstories or “origins” of the cast of VILLAIN. If you check out the left side bar you will see that we’ve done quite a few of them and they add a loot more to the characters in or book. 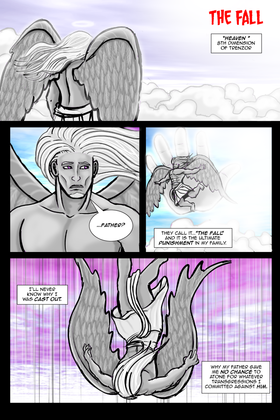 After you read today’s page, I suggest you go check out Galaxy’s origin. It’s a great read and we still have part 3 of his backstory to tell. We usually do 2 Origin stories every 4 issues. The third act of VILLAIN begins after that and what Nathan has planned will definitely blow your skirts up. VILLAIN has always been planned foor 24 issues. the last issue of every arc are giant-sized issues! Go check them out. Issue 6 is about to drop! Enjoy The Fall.